Asking questions is a fundamental part of every definition of coaching I’ve read. That’s why it is a skill that we coaches need to be continually developing. It is a critical talent for you leaders too. Especially if you want to take a coach approach to leadership. If you want to fast-track your ability to have conversations that make a difference, this book is for you. The Coaching Habit: Say Less, Ask More Questions and Change the Way You Lead Forever. It’s by one of my favourite authors and gurus Michael Bungay Stanier. I’ve read all of his books. I love his quirky style and rock-solid content. I’ve been a big fan since he wrote Do More Great Work. Looks like I’m not the only one. The Coaching Habit has only been out since the end of February 2016, and it’s already climbing the charts. To quote Bungay Stanier, The change of behaviour at the heart of what this book is about is this: a little more asking people questions and a little less telling people what to do. So, stop offering advice with a question mark attached (you know you do that) and figure out how to ask more real questions! Michael’s book will show you how. Mine is already filled with highlights. Grab your copy and bust out the highlighters, this is a book you don’t want to miss. Really. Oh, and before you go, have you got a coaching tip or resource you would like to recommend to other coaches? What about a great read for leaders? I’d love to hear about it! Leave a comment in the box below. I am the product of an excellent job coach. He helped me get started in a great career – I not only found the right job but sailed through the interview and got hired. Getting the right coaching can make a world of difference. It did for me anyway. Great job coaches are worth their weight in gold. Hi Bob – Glad to hear that coaching was a positive experience for you. Congrats on the job success! As you experienced, whether it is focused on career transitions, leadership development or dealing with a tough workplace challenge, coaching can provide that confidential thinking partner that is so critical to getting some traction. Thanks for sharing! I am an avid reader, and every now and then I come across a book that I just have to purchase so I can mark it up and make notes. My all time favorite for highlighting was “How to Win Friends and Influence People” by Dale Carnegie. 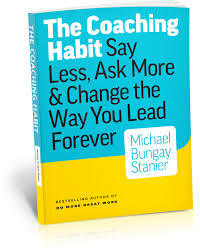 As for coaching books, this one by Michael Bungay Stanier sounds like a winner. If you liked it, I consider it highly recommended. Thanks for the tip! Hi Cynthia – Yes, Carnegie’s book is definitely a classic! Sounds like you are a fellow highlighter fan too. You’ll definitely find a few pages worth marking up in The Coaching Habit. Thanks for sharing a comment here.